Germany’s Metal giants are back! Actually, it feels like they were never on a break, but now that POWERWOLF released their brand new album “The Sacrament Of Sin”, the band is ready for the “Wolfsnächte Tour 2018”. Also this year POWERWOLF celebrates their 15th anniversary and where else can you celebrate an anniversary and a new album better than on tour??? In order to celebrate something, you need to invite some friends. 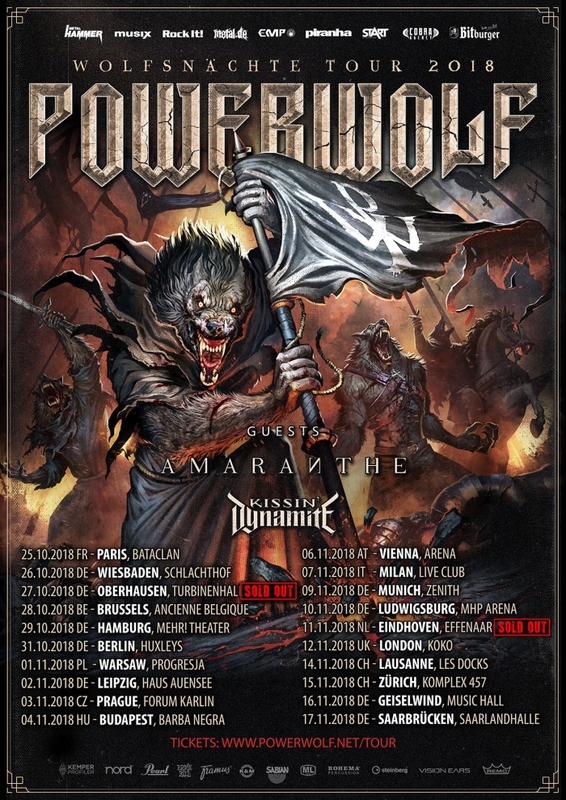 In this case, POWERWOLF invited the Swedish/Danish Electro-Metal band AMARANTHE and German glam-rockers KISSIN’ DYNAMITE to be a part of this tour. One thing is for sure – this is a line-up you really shouldn’t miss! POWERWOLF, AMARANTHE, and KISSIN’ DYNAMITE – a line-up you really shouldn’t miss! POWERWOLF is well-known for their great tour-collaborations. In 2017 they took EPICA and BEYOND THE BLACK on their tour with them. In 2016, XANDRIA and ORDEN OGAN went along. I don’t lie if I tell you that all POWERWOLF-shows I have attended in the past few years (I think, POWERWOLF is the band I have seen live the most since I started taking pictures for magazines) were absolutely amazing and this is the reason why I definitely want to attend the “Wolfsnächte-Tour 2018”. Maybe the bands on this tour are totally different, but each of them is a highlight! With AMARANTHE and KISSIN’ DYNAMITE, they have two amazing bands, which are both great live-performers and you really should give them a listen! Glam Rock is always fun and the boys from KISSIN’ DYNAMITE are really underrated. I attended two shows of their last headlining tour and I was really impressed of how much energy they have and give to the audience, which concert-goers soaked up and gave back with even more power and energy. Tickets are available on POWERFOLF‘s website and cost approximately 40 Euro. Don’t wait too long to order tickets, some dates are already sold out! Are you going to one of these POWERWOLF-dates? Are you looking forward to it? Tell us in the comments and share this article!